Life is too short for poorly planned trips. We offer guided backcountry day trips, multi-day resort based excursions, heli and catskiing, and avalanche courses. Most of the trips we design span from the Rockies to the Selkirk Mountains, where some of the best snow conditions on the planet can be found. The perfect ski trip doesn't have to include countless hours of planning, long nights of driving from one destination to the next, and navigating around unfamiliar ski resorts. Decide which areas you'd like to visit, and leave the rest to us. Follow your guide to the secret stash of powder, or to that untouched corduroy groomer, and focus only on your skiing or snowboarding, and relax, unwind, enjoy. Golden, BC is home to cPow, where Kicking Horse Resort offers world class terrain, both in bounds and in the back country. Come along guided in either or both options. Have us arrange a day of local heli skiing for you to take in the Purcell Range on an even larger scale. There's a lot of buzz around the epic powder in Japan. Our trip explores several ski areas of the Nagano prefecture. 2019 is sold out. Plan ahead to join us in 2020 for a taste of the Orient combined with superb snow quality. Let us take care of all the hassle of planning the perfect Canadian Rockies and Kootenays ski trip. We'll hit the powder highway for Canada's best skiing, in AB and interior BC. Check out our upcoming trip offers here. Our trip with Mike was a superb expedition. From pick up at the airport until drop off 7 days later his efforts in driving, resort selection, trail and off piste guiding and hotel and restaurant reservations permitted us to concentrate solely on skiing. We did the big three: Fernie, Kicking Horse and Revelstoke. Each had its own character with the Kicking Horse steeps and Revelstoke North Bowl being especially memorable. It's an outing we need to repeat hopefully for a longer stay. After 13 years of taking Off Piste Adventures, Canadian Powder Skiing Adventures was the best, better than anything in Europe. Worth much more than we paid; hiring a guide to show our group the best spots on the mountain was the second best decision we made after deciding to spend our ski vacation in Western Canada. I can’t believe there is no one here. If we were in Europe this would not exist. The course instructors were great; they presented the material in a clear and concise manner and gave us lots of hands on practice. The rescue scenario was especially worthwhile. The RAC course was a great introduction to avalanche safety. I thought that I knew Kicking Horse resort but I had no idea. Canadian Powder showed me where the locals ski, now I won’t ski anywhere else. Canadian Powder Adventures was able to put together an amazing vacation for me and my family. Everything from the terrain to the guides was first class. The whole trip was fantastic. The snow was fantastic and the accommodation was terrific. Our guides and B&B hosts made this trip unforgettable. We will definitely be back. We are committed to providing guests with a unique experience beyond expectations. One of the ways that we accomplish this is by involving highly qualified and very personable guides. 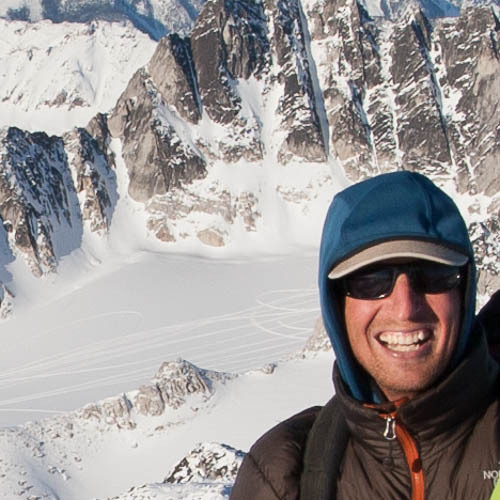 Mike owns and operates Canadian Powder Adventures, and combines this with part time employment at Kicking Horse Resort on the mountain safety team, as well as teaching avalanche courses to skiers and snowmobilers. Mike has been working in the ski industry for over 20 years around the world including 9 seasons in Chile and Argentina, where he worked for CASA Tours as an integral part of guided ski/snowboard trips. He's called Golden home for the last 16 years. Mike is certified with OEC and OFA first aid, CAA Level 1 and 2, and is a professional member of the Canadian Avalanche Association. During summers Mike works as a contract tree faller in the forestry sector. In his free time he and his wife Claire enjoy mountain biking, camping, hiking, and of course, skiing. Matt is certified with the Canadian Ski Guide Association, and a Professional Member of the Canadian Avalanche Association. He has a broad range of skiing expertise, which is supplemented with his fully certified Level 4 accreditation in the Canadian Ski Instructor Alliance. Matt worked 12 seasons in Portillo, Chile as Assistant Snow Safety Supervisor, and as a lead guide with their heli skiing program. Originally from central BC, Matt has settled in comfortably as a recent transplant to Golden. Matt radiates his love for skiing every moment, and is always up for that last hike, touring lap, or just one more run on the slopes. Those wanting to sharpen their skills can take advantage of his profound teaching background. Ian's spent many winters guiding for a multitude of operations, and now combines part time guiding with a full time avalanche tech position with the BC Ministry of Transportation, here in Golden. 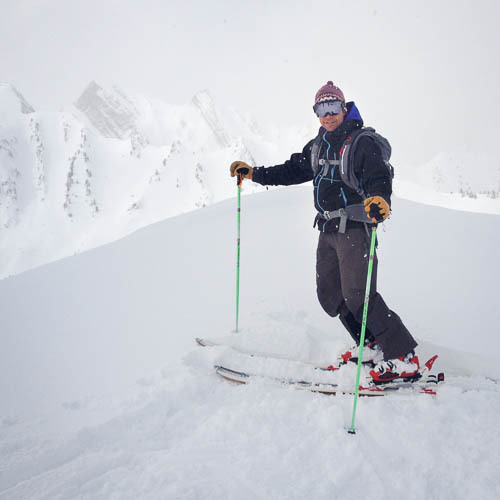 He has an impressive ski touring resume, having completed several traverses in remote and heavily glaciated terrain. Ian's contagious laughter and passion for the outdoors make every day memorable for his guests. He has lived in Golden for 18 years, is a former senior ski patroller at Kicking Horse, and his certifications include ACMG Ski Guide, CAA Level l and ll, and OEC first aid. Ian and his wife Brianna, are excited to be raising their wee boy, Crosby. Lisa has been skiing for 20 years. It all began in the province of ON, and she intially taught skiing at Mount Molson in Petawawa. She continued teaching at Lake Louise, AB, The Nevis Range in Scotland, and Revelstoke, BC, while earning her CSIA Level II. She is certified with the CAA Level I and OEC First Aid, and is working her 8th season on the mountain safety team at Kicking Horse Resort. Her summer work is as a Via Ferrata guide, and downhill mountain bike patroller (also at the Horse) . She spends her free time traveling, ski touring, mountain biking, and whitewater kayaking with her husband James.